Join us for a lively discussion about death while eating cookies, cakes and brownies. We are one of over 4,000 Death Cafes around the world. Enliven your life with the realization the it will be over before you know. Meet new like minded friends along the way. 11am and 1pm on Sunday's throughout the summer. Come hear the behind the scenes stories of those that made some pretty daring stunts at Niagara. 10am is the Tree Tour with Cornell Cooperative Extension John Farfaglia. Always a popular tour, John explains Oakwood's varieties and what you can grow in your yard. 11am Stump the Master Gardner with Marge Gillies. Bring your toughest gardening question and see if you can Stump Marge. Also, bring a soil sample for testing. Cemetery Tour. Visit Oakwood's notable folks and learn the history of Niagara. Join us as we unveil a marker sign honoring three of our permanent residents. The signs signify a person or persons of distinction in the cemetery. Every year there are six nominees and a tally is taken from online voting to narrow the field down to three. Oakwood Cemetery Association will hold a short service to remember those who have been buried at Oakwood in the past year, and to honor the memory of our Military residents. “We welcome family members of our residents as well as the general public looking to remember the lives and service of Military,” said Tim Baxter, Chairman of the event. There are over 900 Military members buried in Oakwood from the Revolution all the way through to the present. Monte and Marcia Jones will be on hand to provide patriotic songs for the service. There will be a reading of “In Flanders Fields”. Names of those that have passed this past year will be read, and a chime will toll for each person. The Niagara Falls Fire Dept. has graciously loaned Oakwood the use of their ceremonial bell for the tolling. The ceremony will begin at 10am on May 29, 2017 in the Veteran’s Section in the front of the Cemetery. Join us as we search Oakwood for warblers and other spring migrants. Meet at 8:30 am near the front office. Our leader will be noted amateur ornithologist Chris Kundl. 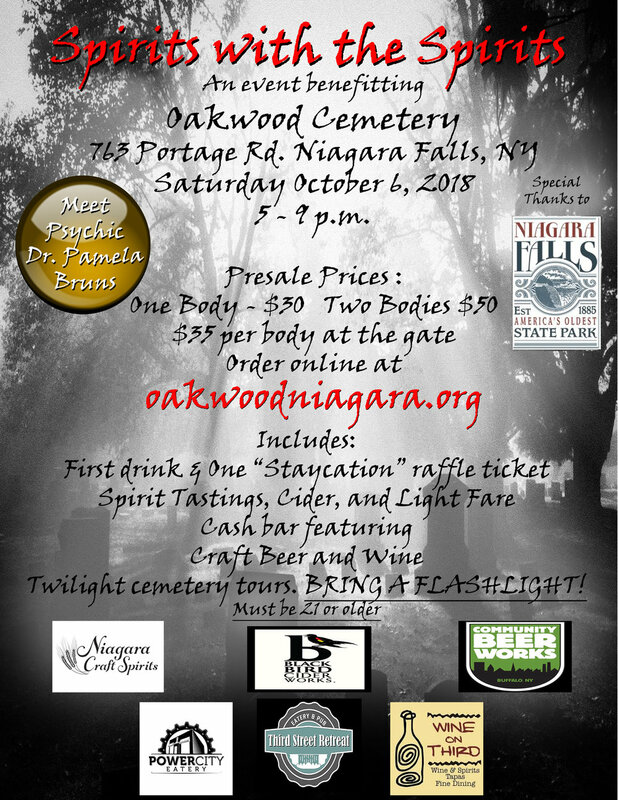 "Daredevils of Niagara: Stories of Desire, Deception, and Desperation” explores some of Niagara Falls’ most famous "daredevils," all of whom were laid to rest in Niagara Falls' historic Oakwood Cemetery. Focusing on the real people behind the sensational headlines and moving beyond the superficial notion that Niagara's daredevils were simply crazy, the talk invites a consideration of the reasons ordinary people sometimes take extraordinary risks. Receive half price admission for NT Second Thursday. Oakwood Cemetery will once again take part in Beautify Niagara. We are looking for volunteers to come to Oakwood between 9 - 12am on Saturday morning to pick up papers, and assorted trash, or to rake up leaves and pick up sticks, etc. Bring a rake and a pair of gloves. We will provide trash bags for paper and boxes for branches. Come and help us to beautify Historic Oakwood Cemetery!